A Floating Island for the Pool, Lake or Ocean - Not Your Average Inflatable Pool Tube! A massive floating island for the swimming pool, lake or ocean, the Sofa Island Lounger from Swimline is not your average pool supply. This model from Swimline is like a regular inflatable pool tube but on steroids, with an exceptionally large size that will comfortably seat four adults. The removable ottoman allows swimmers to resurface right in the middle of this lounger, or sitters the ability to relax their feet in the cool water. This ottoman is a unique feature both kids and adults will love. 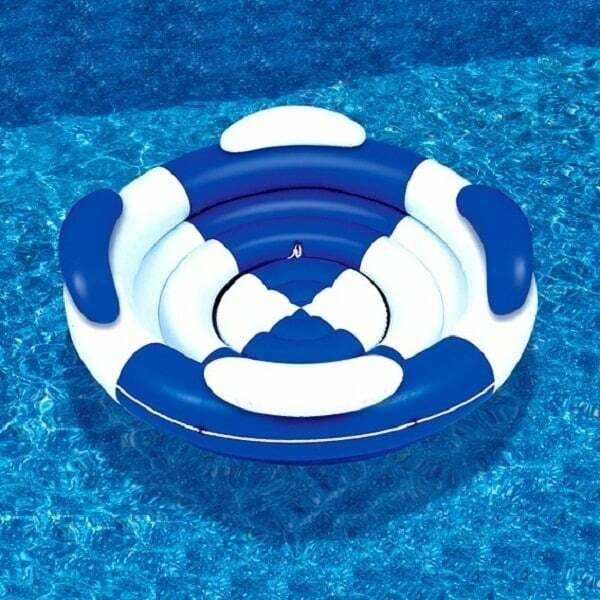 Bring it out on the lake or ocean and attach it to a pontoon boat, or let it slowly drift around your swimming pool providing a fun island the kids can climb over. Regardless of the environment, the Sofa Island Lounger from Swimline is a sure bet! For online orders over $40 (before tax), shipping and handling is FREE. Orders that are under $40 will have a $5.99 shipping fee added. Most pool supplies ship via Fed Ex and delivery times within the Continental U.S range from 2-5 days. All orders received before noon will ship that SAME DAY.